Depending on what level it is set to, the headlight range control adjusts the position of the light cones in the headlights according to the load that the vehicle is carrying. This gives the driver the best visibility possible and means that oncoming traffic will not be dazzled . The headlights can only be adjusted when the dipped beam headlights are switched on. – Front seats occupied and luggage compartment empty. 1 All seats occupied and luggage compartment empty. 2 All seats occupied and luggage compartment fully loaded. Towing a trailer with a low drawbar load. 3 Only the driver seat occupied and luggage compartment fully loaded. Towing a trailer with maximum drawbar load. There is no control ① for headlight range if the vehicle has dynamic headlight control. The headlight range is automatically adapted to suit the vehicle load level as soon as the headlights are switched on . 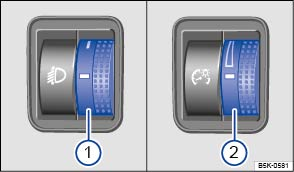 The brightness of the instrument and switch lighting can be adjusted using the button and the and Light function buttons in the infotainment system . Depending on the vehicle equipment level, it may be possible to adjust the brightness of the instrument and switch lighting to suit your requirements by turning control when the headlights are switched on. The instrument cluster lighting switches off automatically in darkness and at other times, e.g. when driving through a tunnel. This is intended to prompt the driver to switch on the dipped beam so that the vehicle's rear lights are switched on . Heavy objects in the vehicle can cause the headlights to dazzle and distract other road users. This can lead to accidents and serious injuries. The light cone should always be adjusted to the load level of the vehicle to ensure that other road users are not dazzled. Failure or malfunction in the dynamic headlight range control can cause the headlights to dazzle or distract other road users. This can lead to accidents and serious injuries. Proceed to a qualified workshop to have the headlight range control checked immediately. a) If you have different loads, you can select a position between the settings.